The AR Rifle is a rifle that takes some getting used to, looking at it, as well as shooting it. The rifle amazingly, is capable of excellent accuracy, equaling the capabilities of a good bolt rifle! 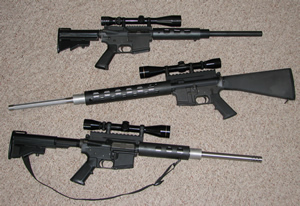 The AR-15 or "mouse gun" and the AR-10 rifles have replaced the tried and true Match guns of the past, the M1 and the M1A. The low recoil of these rifles and lack of position loss during reload make it a hard gun to beat during the rapid fire segment of the course. The AR-15 as a Varminter is also a fabulous rifle. The low recoil allows the shooter to fire a second or a third shot at multiple targets as they appear on the mounds. Here at the Hofmeister Custom Shop we don't care what or how the "other guys" build their guns. We build custom AR's as we know they should be built! With 17+ years experience with the rifle, we know how they work and what it takes to make them shoot the centers out - day in and day out. We manufacture our own Steel tubular hand guards, Gas blocks, Scope Mounts and Match sight bases. If you are looking for a mass manufactured gun, buy one. We build Custom rifles for the discriminating match and target shooter. We recommend and fit Krieger and Chanlynn barrels as a norm. We will fit others as our customers want and furnish. Quality and uniformity are the two biggest. We prefer to use our quality in house parts. If you chose to use parts from outside manufactures there may be additional charges for bringing those parts up to our standards. Our parts are built right the first time. We build AR-15's in several different calibers to suit the Target and Varmint shooter. The .223 is head and shoulders above the rest due to the quick twist barrels and heavier match bullets now available. We do not recommend the 6BR as a cartridge for the AR15 as it requires too much material to be removed from the bolt. Safety reasons and the guns longevity are affected by this modification. the New .204 Ruger is a hot varmint cartridge great for prairie dogs and coyotes, Tickling ranges and testing your own abilities to shoot. We also build a carbine configuration or "Shorty" as they are referred to. We build shorties in all of the calibers and different styles we offer. A more portable rifle, and easier to swing in close quarters, the Shorty with a 17" barrel coupled with the 7.62x39 (with a .308 Groove) are devastating on close in called coyotes. We also build uppers in .30 fireball (.30x221) just for the fun of it! The AR-10 is just as verstile as the AR-15 and we build them in the same configurations as our AR-15s. Steel tubes custom gas blocks and systems for all the more standard short action calibers. Target shooters have embraced the 6.5/08, 7mm/08, 6XC, 6mm x 22/250 and of course the venerable .308win all of which make excellent target guns. We make custom sight blocks and bases for the AR-10 as well as our AR-15.